It is an interesting photo, you're right. 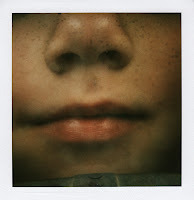 Is she freckled, or is that just the texture of the Polaroid? Heh. On a related topic, there's a poem which describes the music produced when the violinist draws across "The intestines of the agile cat, the tail of the noble hoss." But violin bows really are made with horsehair. But it is still made from intestines, which is not real pleasant to think about. Argh !!! I have a full body derm check up tomw at 5! I hope the cyst stays gone for good; those full prices are staggering but I guess in Paris it would be free! Love the close of Miss M's face; hope you have the real polaroid! Oh insurance and health care. Sigh. And yes, the magic f Polaroid! Cool photo. I had those same kind of dissolving stitches deep under the surface for a thing that was taken out near my shoulder blade. The plastic surgeon failed to tell me that he had put those in and when the top layer healed, I flipped out because I could feel the sublayer like a row of pearls under my skin. yikes. My doctor friends all say that if it's on the face--go to the plastic surgeon first. The plastic surgeon isn't afraid to "go deep" to get it all because he/she knows that he/she can fix it.